Michael Branca bounded to his door when I showed up at his Munjoy Hill apartment one recent Wednesday evening. "Welcome," he said, his smile infectious. He quickly led me into his living room/studio. Grinning, fanciful characters watched from paintings dotting the walls. Two gargantuan canvases balanced on easels in the center of the room, patches of paint still drying. Branca calls himself a stubborn optimist and his sunny disposition speaks through his work. His paintings are so warm and full that you can't help but feel at ease in their presence and want to smile back. Branca's second solo exhibit, Naked and Smiling, opened earlier this month at the Filament Gallery in Portland, but while oil has been Branca's focus this spring, it's certainly not the artist's only medium. Branca's not-so-secret secret is that he collects bugs, dead ones. And he has a growing number of "bug scouts" who send him specimens from all over the country. Many of his bugs are stowed safely away, but some adorn his walls in works like his "The Last Supper," where the bugs, positioned carefully along the table, replicate the familiar biblical scene. Originally from Boston, Branca, 27, first came to Maine to attend Colby College. After a short stint in Taos, NM, he decided to return here and make his home surrounded by what he hopes is a growing art scene. Maine Times: What's the scene like in Portland? A: I feel like there's a lot hiding. There're a lot of artists that you don't necessarily know are there. But it is growing. People talk about how it was five, ten years ago, how there weren't as many art galleries, that there wasn't as much going on. My show's going to be at Filament: I get excited for them. They're two young artists that are opening a gallery. That's inspirational in itself, that they're making a go of it, here. They think they can make it work on Munjoy Hill, which is great. Q: It's in the former Munjoy Hill Market? A: Yep. This is the first show in their new location. Q: How's Portland's First Friday Artwalk coming? A: I think it's a great thing, but it has a long way to come to really become fully successful. A lot of people are quick to judge it and say that it's not working out, but it's still new. The concept is great and it works well in other cities, and I'm assuming it will work here. I think it's hard for galleries like Filament and others that aren't right in the concentrated downtown area to feel the traffic sometimes. Looming behind Branca is an 68x48-inch, oddly shaped canvas, something like an inverted triangle with the top/bottom chopped off, brightly painted with a blue sky and white stars. At its base is a half-circle representation of Earth. Toward the top of the painting is a small, naked boy, careening away from the planet, tethered only by an umbilical cord. Sperm-shaped stars sparkle in the foreground. On the opposite hallway wall is a work also bordered by stars which showcases a woman wearing a Cheshire grin hovering horizontally face-forward over a mountainous landscape, her mountainous breasts drooping downward, her tiny toes barely visible in the distance. Q: Are those two pieces related to each other? A: The woman painting would be more of the positive, everything's-good, big Earth, mother nature, happy piece. It's a "Universe is Good" kind of painting. The other painting uses some of the same symbolism, but things are out of control. It's called "Connected." Branca gets up and pulls out another rectangular canvas that will be hung above "Connected." It shows a rope, stretched across the night sky, fraying. Q: So, he'll be disconnected shortly? A: Yeah well, in the original sketch I did the fraying in the actual [umbilical] cord. I didn't like how obvious that was and I wasn't sure what I meant by it. It seemed too pessimistic, so I gave him an intact cord. The rope could be a thought bubble or a warning. He may be worried that it could break. It's more up to the interpretation of how you want to read it, so I made it a separate painting. Q: It's an amazing shape, too. I've noticed your work tends to be quite large. It's a wonderful size. A: It's an obnoxious size [laughing]. I love working that big. I'll do smaller paintings and I'll get caught up in the details more, but if I've been doing a bunch of small work and I stretch a big canvas, it's physical. I love it. It's the right scale for me. I like paintings that are basically the same size as me. If you're working on a little piece, you feel cramped. You're always kind of hovering over it. With a small piece, I tend to know in advance exactly what I'm going to do. I work the composition out and I paint it. With a bigger piece, I get the initial image down and all of a sudden there's all this blank space and I want to fill it in. Q: Is this your preferred medium? A: Oil painting to me is a lifelong challenge that I've been doing for ten years now and it still completely baffles me. With each painting, I feel like I improve, but it's intense and takes a lot of focus. In order to be really doing it, it takes working everyday. The bug stuff is less intense in that way. It's not so much about learning the process. It takes a lot of commitment to stretch a large canvas and say, "I'm going to finish this." Whereas, with "The Last Supper," I feel a lot of its strength lies in the concept, but the actual process is more methodical. "Ah-ha!" I think. I was wondering if we'd get around to the bugs. I know Branca has an affinity for the small creatures, but I haven't yet had a chance to ask him how his collection is coming. Q: Are people still sending you bugs? A: That's a whole thing in itself. That's been going on for four years now. It started at a gallery in New Mexico. I put out a cigar box full of dead flies. On the cover, I drew picture of a fly and wrote "free." It was funny, but it got old fast. Next I tried laminating them and selling them for a quarter. That grew into a mini-campaign, a semi-tongue-and-cheek type of deal just to see what would happen. I'm still getting bugs from strangers all over the country, collecting bugs because they've got a reason to. I think that's the greatest thing. These are Mike's Laminated Real Dead Bugs. [He takes out a small, hand-lettered container.] You can help yourself to one or two if you want. I don't kill them. I find them dead. I have a disclaimer on some of my boxes that says: "100 percent-found dead bugs. No bug has been injured for the purpose of art or profit." Suddenly, like a kid at Christmas, Branca gets a gleam in his eye. He gets up, scurries to the other room, and returns, arms full of boxes. "Since you're here and you're asking," he beams, proffering the contents of the boxes. "I get these presents, it's so cool." As we probe the boxes and slowly uncover their treasures, I'm treated to a parade of bugs in varying degrees of decomposition: moths, grasshoppers, dragonflies, crickets; one cricket so emerald green, it almost glows; a butterfly so large, it must have come from an exotic land. Some of the bugs were simply thrown into envelopes and sent, arriving as nothing but dust and wings, Branca says. Others are so gingerly packed and carefully organized, the packaging clearly supersedes the value of its contents. One "bug scout," who collected his specimens while hiking the Appalachian Trail, concocted a makeshift container out of a small toothpaste carton. This bug transporter was complete with individual compartments and filled with various critters when it arrived in Branca's mailbox. "I'm not so interested in what they are called; I just love them. Some of them are so amazing in themselves that I can't imagine making art with them," Branca says. 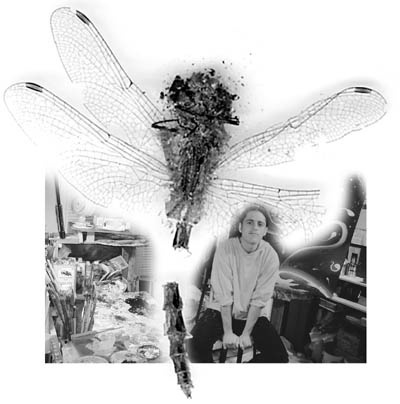 He would like to do a show that would encompass not only his artwork, but also the bugs in his collection and the packages they came in. Q: I keep looking at these bugs, then up at the surrounding paintings. A: If you can find the connection--you'd probably need a good psychologist to figure it all out. I don't know. It's about fun and life, I guess. I just get a kick out of it. I think a lot of the bug thing is getting a kick out of people doing it for me. It's gross and it's weird, but I get these amazing things. Q: In your artist's statement for Naked and Smiling, you talk about this show as an expression of trying to find peace in the "self world," the "people world" and the "natural world." Which one of the three do you struggle with the most? A: It's a constant push/pull with all three. You're getting personal all of a sudden. Here I was, showing off my bugs just a few minutes ago. I'll start with the natural world. I think the natural world is something we're all losing track of. It's hard to feel connected to it, especially during a Maine winter when you spend 99 percent of your time indoors. Do I feel connected? Sometimes I feel totally removed from the processes of nature. We're just these aliens in this system that's been going on forever and here we are trying to screw it all up. The self world, well that's the struggle that we're all trying to figure out. Trying to do what you love and trying to figure out how to find balance. The people world, that might be the hardest place to find connection. That's what we're all doing. We all assume everyone else has it figured out. Mike's Real Dead Bugs is currently in the throes of its 2001 Dead Bug Drive. Branca's press release urges those interested in contributing to "clean out your windowsills and radiators, and send in those bugs!" Contributors who donate a bug or bugs will receive a free, limited-edition, laminated "Dead Bug Scout" card, inscribed with his or her name and bearing an honest-to-goodness Real Dead Bug. Branca's substantial oil paintings are on view through May 18 at the Filament Gallery in Portland. If you ask nicely and smile, you'll find that Mike's Laminated Real Dead Bugs are also available at the exhibition. Meanwhile, scouts may send bugs (dead only, please) to Mike's Real Dead Bugs.